SIMPSON BAY, St. Maarten (Friday, December 21, 2018) -More and more private jets are returning to the Princess Juliana International Airport, SXM, according to available figures spanning the peak period for the General Aviation sector. From Friday, December 14th, 2018 to Thursday, January 31st, 2019, a total of 114 aircraft have been approved to park at the airport with seven pending approval. Boxing Day, December 26th, 2018 will be the busiest day with 21 private jets expected to arrive, while Saturday, January 5th, 2019 will see the largest number of departures with 15 aircraft scheduled to leave on that day. The aircraft types have increased tremendously in comparison to previous years, with most of the jet-setters flying the latest aircraft. SXM Airport was ranked second in General Aviation in the Caribbean, behind The Bahamas prior to Hurricane Irma. Aircraft movement in this sector dropped significantly by 1,488 last year from the record 7,939 it had hit in 2016. 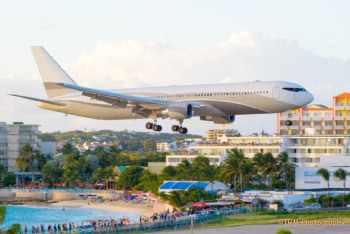 This was due to Hurricanes Irma and Maria that forced private jets that would normally come to St. Maarten, especially from December to January, to seek other destinations. “Under the circumstances, St. Kitts and Antigua have been cutting into our market share, but we are coming back stronger,” said COO Michel Hyman. Plans are afoot for the remodeling and upgrading of the FBO facility which exclusively caters to the high-end travel operations. The existing facility located to the West of the Terminal Building was used temporarily for arriving passengers post-Irma. The remodeling of the existing FBO will allow the jet-set traveler to move through the processing more efficiently and offers a more spacious area with a passport control, security point and customs. Modifications will also be made to the lounge for the luxury traveler. The new design now calls for a two-story building, as the FBO operators will also be housed on the premises.